Any regular readers of this blog (and excuse the hubris of even imagining for a moment that such things exist) may recall that I have blogged on more than one occasion about Lush, one of my favourite ever bands, who I used to go and see as often as possible in the nineties and who recently announced that they would be reforming after twenty years. Of course I was going. They announced a couple of dates at the Roundhouse, for both of which I booked tickets, plus one in Manchester for which, after a moment's hesitation, I also booked a ticket. I could work out travel and accommodation later. I drew the line at the American dates - that would be ridiculous. And then with less than two months to go, they announced a warm-up gig in London a ticket for which I booked at the drop of a hat, sitting nervously in front of the computer refreshing the browser as the time approached 9am, waiting for them to go on sale. A long way from twenty years ago when I sent off a cheque or (rarely) booked tickets with a credit card on the phone. This was a new anxiety for busy people. Plus of course everything's a thing these days. Come the day of the gig I was experiencing an unusual nervousness. I caught the train up to London and over the course of an afternoon (I had a few errands to run) walked from Victoria to King's Cross. By the time I walked down into the underground I was coming down with full blown pre-gig nerves. 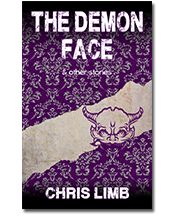 All the symptoms were there, dry hands, lightness of head, shortness of breath, heart racing. Yet I had always imagined pre-gig nerves should only apply when I was playing a gig, not when I was watching one. Disembarking the Overground at Hackney Central I began to worry I was about to have a panic attack, which annoyingly can be something of a self-fulfilling prophesy. Thankfully the venue was right next to (if not actually part of) the station so there was no long walk of doom to ramp up the suspense, if anything waiting in the queue helped calm me down, replacing the nerves with excitement. Inside the venue it was nicely dark. A smallish space with a stage at one end and a bar down the side. Already everyone ahead of me in the queue had taken their places in front of the stage so, after buying a drink, I joined them. There was no support and the band were due to come onstage at 8.30pm sharp - there'd be no hanging around wondering when things would get underway. I looked about at the gathering crowd, at the set up on the stage. Guitar technicians came and went, testing and tweaking. 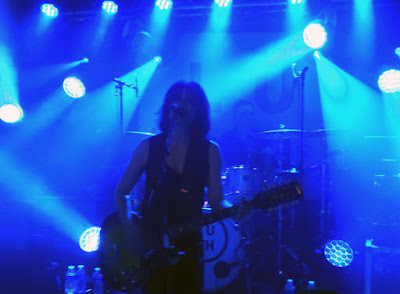 I thought of how many times over the past seven thousand days I'd had that recurring dream, that I was finally at another Lush gig and that this time it was real. Except that this time it was real. The lights dimmed (even further) a short intro track played and the band walked onstage. It was them. There. Just like before. "Hello. It's been a long time. Yes. No red hair, get over it." And they went straight into De-Luxe, my favourite song and I was away. Beforehand I'd worried about being overcome with emotion, about tears coming to my eyes. The emotions certainly came, but not the ones I was expecting. As the well known song - a song hard wired into my synapses - shimmered to its glittering ending I found myself laughing out loud. This was all too joyous for tears. And then there was Breeze, and as I danced and watched and enjoyed I was overcome with a strange feeling. What was it? Yes I was very happy, but there was something else about the situation. And then it hit me. How utterly familiar all this was. There they were standing up there where they'd always stood, just like that, it was all coming back to me. It may have been more than seven thousand days since the last time, but I'd been here before. The thirty plus gigs I'd attended in the nineties had burned this into my brain and the experience still fit perfectly. I was at a Lush gig. Already it was starting to feel like one of the best Lush gigs I'd ever been to. Initially a lot of this feeling came from the surprise and the novelty, the exhilaration at revisiting something which - despite the recurring dreams - I'd been sure would never come again. I had never been happier to be proved wrong, as song after song said hello to my primary auditory cortex, the difference between listening to these on vinyl, CD or MP3 and experiencing them live as extreme as the difference between flipping through a photo album and going to a reunion of friends you haven't seen for twenty years. And, just like at such a reunion, after a while it began to seem as if the intervening twenty years had never happened. As the show continued it kicked into a higher gear, no longer simply one of the best gigs due to its position in time, but due to the sheer energy flowing from the stage, carrying the audience forward through time on a wave of scintillating sound. There was not a wasted moment, the set largely concentrating on the band's earlier output - the EPs and the first two albums - into which new song Out of Control fitted perfectly - with only Ladykillers as a nod to 1996's Lovelife album. Coincidentally this reflected my own (and perhaps a large percentage of the audience's) listening habits over the past two decades. Having started with De-Luxe, the set closed with Sweetness and Light. This was another favourite, always a live high point and one of the first things to enter my head when thinking of Lush. Of course the gig was over all too soon - despite the generous amount of encores including an epic Desire Lines - and I left fairly quickly as I had a lot to think about. It would be a long time before I came back down again. One thing was very clear to me - this was not some cash-in comeback and reunion, this was a carefully considered continuation, a picking up. But while I was sure that there would be many more shows (after all I had tickets for some of them) I was also sure that there wouldn't be one quite like this reopening of a door.